We’ve all heard the phrase, “Practice Makes Perfect.” Well, I’m here to tell you that practice does not make perfect. Instead, “Perfect Practice Makes Perfect,” according to Vince Lombardi. And that goes for just about anything. Hence, Perfect Practice Makes Perfect in Medical Coding. … Unless you practice in a “smart way”! At least that’s what Daniel Goleman states, and I tend to agree. What Is Meant By “Perfect Practice Makes Perfect”? Repetition is one of the key factors for achieving success. But repeating the same wrong moves over and over will only result in a lot of wasted time. And there is no point in practicing moves that you have already perfected. Instead, you need to work on skills that need perfection and practice the right moves repeatedly. This will result in success. As you repeatedly carry out this perfect practice routine, it will take you from intentional focus to effortless execution. Specifically, you will be able to perform the routine skillfully and automatically and come up with the right result. If you develop a problem along the way with perfecting a skill, chances are you are doing something wrong. That is to say, you are not doing the right things, in the right order, at the right time. Something in your behavior is out of sequence. So, repetition is important to success. Besides that, though, you need to know if you are doing something wrong and learn how to practice it the right way in order to perfect it. And that goes for whatever you want to excel in, including Medical Coding. In medical coding, it’s all about the guidelines, rules, and conventions. 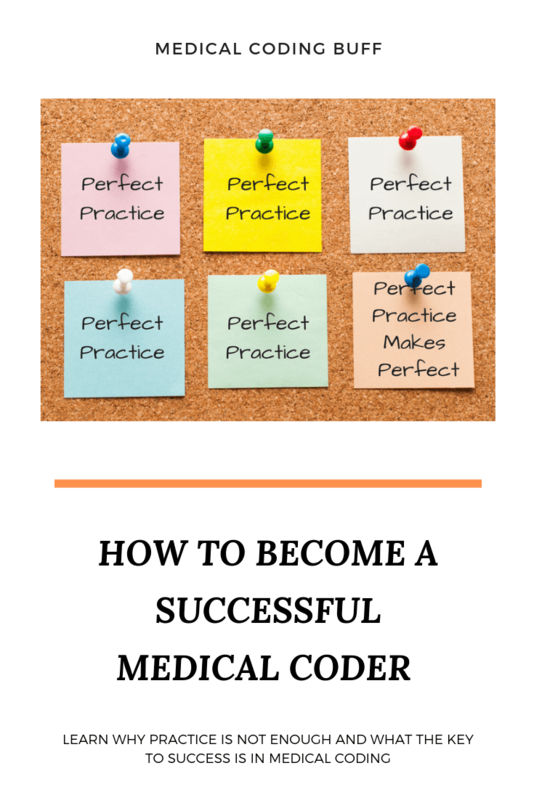 Repetition and applying the right guidelines at the right time are fundamental to becoming an excellent medical coder. Therefore, if you practice, practice, and practice some more, applying the right guidelines in the right sequence at the right time, you will be practicing perfectly. And that makes Perfect! The CPC certification exam includes CPT, HCPCS, and ICD-10-CM coding questions. These multiple-choice questions require your ability to locate the correct code(s) based on coding guidelines, conventions, and instructional notes. It is critical that you pay close attention to all the information provided when looking up the correct code in your coding manuals. Otherwise, chances are you will assign an incorrect code. 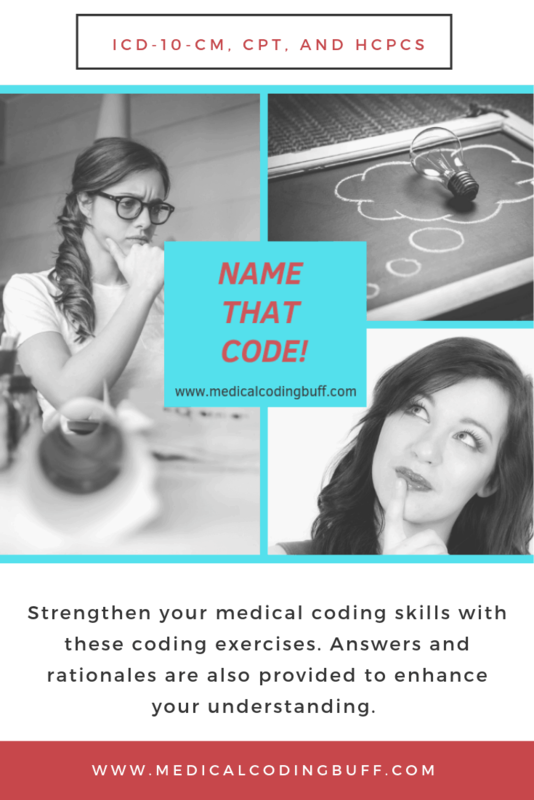 In order to help you strengthen your medical coding skills, I want to share with you my Name That Code! coding exercises. And I will continue to add new coding exercises on a regular basis. Get FREE access to Medical Coding Crossword Puzzles, Coding Exercises with answers and rationales, and MORE! By practicing these coding exercises repeatedly, you will learn how to apply the coding rules correctly and discover the right code(s) quickly and effortlessly. So, apply the Perfect Practice Make Perfect advice provided above, and get practicing! Success won’t happen overnight, but you will get there! What’s the Difference Between Medical Billing and Coding?